The VEF2 Earth Leakage Protection Relay forms part of our extensive range of low cost, high specification RCDs which are user adjustable to a wide range of trip levels and response times for precise system protection. It is designed for high current applications where it can be connected to any of the FDB wide range of external C.T.’s. The fully encapsulated construction of the VEF2 provides excellent temperature stability, together with high immunity against shock and vibration. It is housed in a compact flame retardant halogen-free Din-rail mounting polycarbonate enclosure which is complete with integral test, reset buttons and LED status indication. The VEF2 features fail-safe operation with manual reset after fault trip, auto reset after power failure and trip status latched until reset (with power supply on). A Non-Failsafe version is available to special order for use in applications where shunt tripping of primary/supply breakers makes failsafe impractical. It is powered from an isolated ac/dc power supply from 24-240V so allowing external C.T. earthing if required. It also features, via terminal connection, a very wide settable current range, from 0.02 Amps to 30 Amps over 3 ranges. 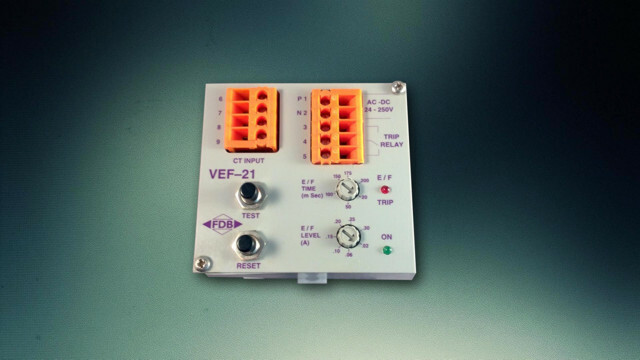 The VEF2 is designed to react to alternating current only and reject stray DC signals. Accuracy is maintained from 5Hz to 800Hz thus making the unit suitable for application on variable frequency drives. The VEF2 can be used on solid, medium or high resistant grounded installations and by using the FDB Electrical recommended artificial ground. 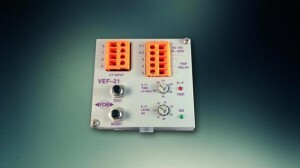 Share the post "VEF2 Variable Earth Leakage Protection Relay"